The first secret to good cooking is using the freshest ingredients available. The second secret is to use the best cookware you can afford. This is especially true in making the french onion soup recipes we posted yesterday. I believe the Le Creuset cast iron dutch oven I used helped me to achieve that great rich flavor. Le Creuset has been manufacturing and perfecting enameled cast iron products since 1925. My grandmother had a 9 quart Le Creuset dutch oven that she used every Sunday. How I loved her famous braised chicken! The dutch oven has been passed down to my aunt and it looks brand new! 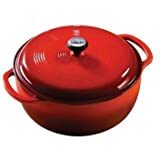 I splurged and bought my 7.4 quart Le Creuset dutch oven about 5 years ago and don’t know how I managed without it! The cast iron provides superb heat retention and distribution, and the enamel is hard-wearing and non-reactive. I love the fact that it can go from the oven to my table. It’s a beautiful way to serve a rustic meal. 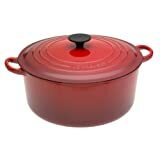 I also really like my Lodge Enameled 6 quart dutch oven. I wanted to try it because I love the Lodge cast iron frying pans, especially the 10 inch skillet. It works great for omelet’s – thank you Rob for the recommendation! It too can go from oven to table for easy entertaining. I consider both of these must have tools in my kitchen.